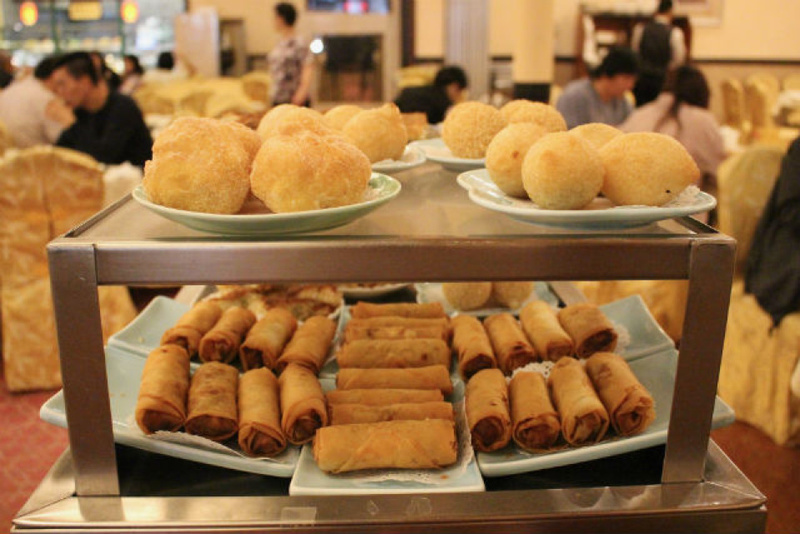 The San Gabriel Valley is a mecca for dim sum. Fans of the Chinese brunch-time cuisine are fiercely loyal to their favorite spots — joints where the har gow glisten in their crystal-skinned glory and the pork-filled siu mai are always on point. If a place like NBC Seafood Restaurant, a Monterey Park mainstay that's been around for 30 years, still draws hour-long lines on weekends, you know it's among the old-school elite and it's doing something right. The secret to NBC Seafood's success might have something to do with how its staff hand-makes its 200 dim sum dishes every day. 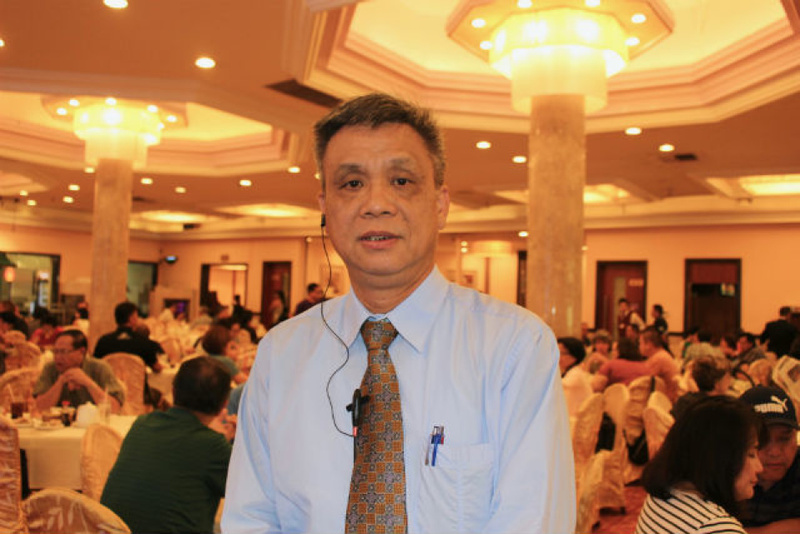 It might also be thanks to general manager Kenny Chen, who runs the tightest of tight ships. Chen has been at NBC Seafood, a corporation with several owners, for 28 years. He started as a waiter and worked as a captain before moving into management. We wanted a behind-the-scenes look at how his well-oiled machine operates, so we convinced Chen to let us spend a couple of days shadowing him during the restaurant's busiest Friday and Saturday dim sum shifts. At NBC Seafood, dim sum service runs daily from 8 a.m. to 3 p.m. Two hours before the restaurant opens, chefs trickle into the kitchen for their shifts. For the next seven hours, until 1 p.m., a team of 14 to 16 people will continually hand-make the dim sum items. The massive Chinese banquet hall has 900 seats. 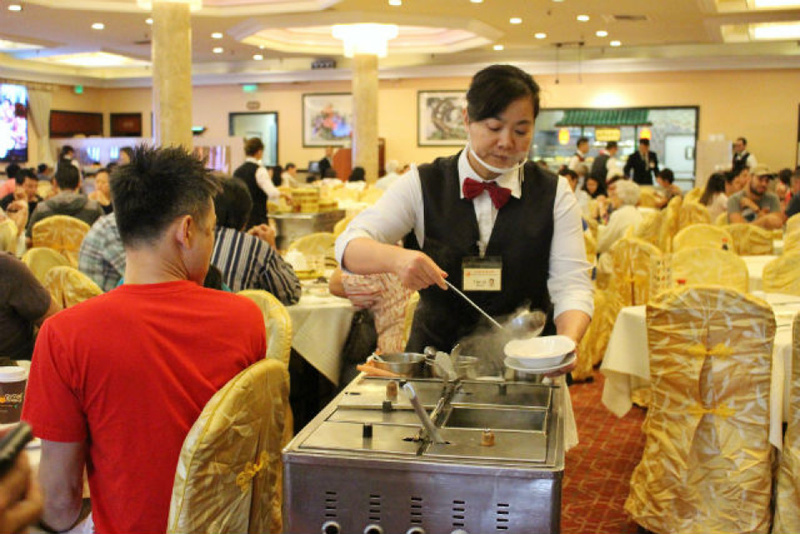 On busy weekends, Chen says they'll serve at least 2,000 customers per day for dim sum. How many of their signature items do NBC Seafood's employees need to produce for such a huge operation? The numbers are so staggering, Chen has no idea. "I never count it," he says. "You can't count it." Chen wears a headset, discreetly giving instructions to employees as he zigzags between tables. He walks me through the kitchen and into a room full of workers, each performing specific tasks at different stations. At a long metal table, three people wrap potstickers, expertly pinching pleats around the edges of the dough. 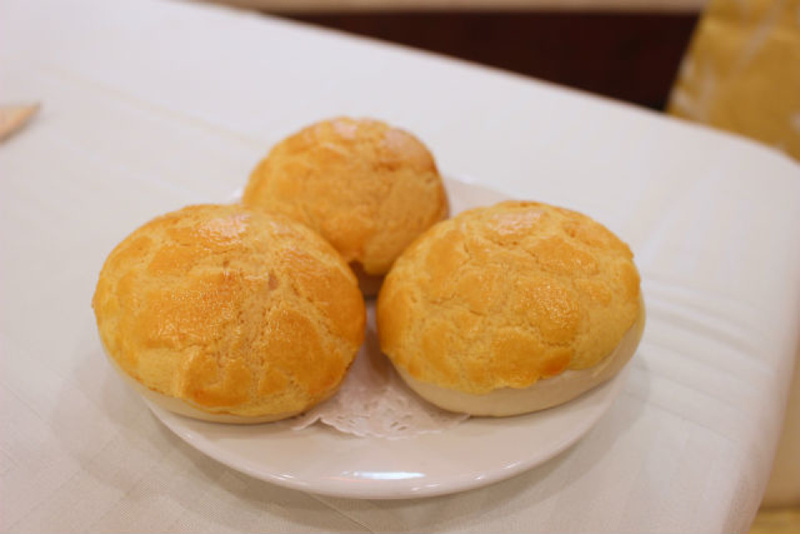 One man is singularly focused on creating bo lo bao, or baked pineapple custard buns. Contrary to their name, they don't actually contain pineapple. They do, however, have a yellow, crumbly top that resembles the tropical fruit. 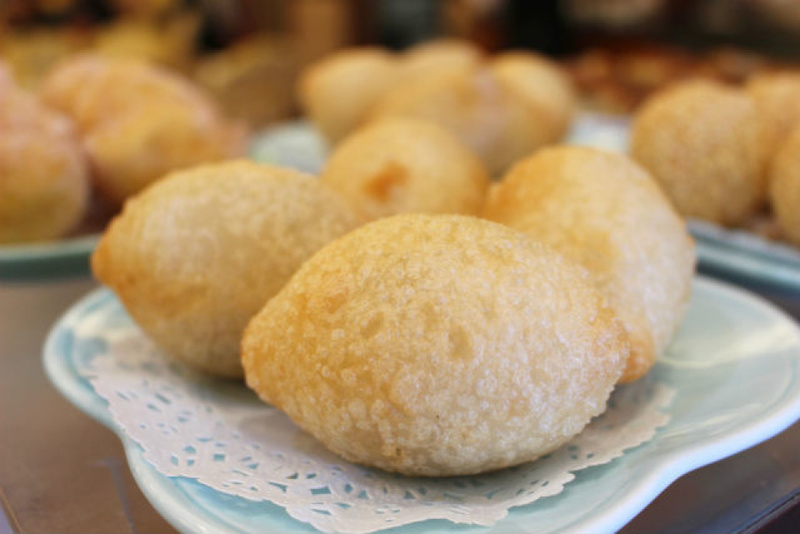 When you take a bite, you'll get a smorgasbord of textures: a sugary crust falls apart once it touches your lips and you dive into the springy, custard-filled bun. Another man gingerly rolls warm rice noodle sheets around whole cooked shrimp for the har cheong fun. Nearby, two more chefs top lotus leaves with sticky rice, slices of Chinese sausage, barbecue pork and dried scallops. Chen explains that in order for the flavor of the fragrant lotus to infuse the rice, these leafy, wrapped packages (aka lo mai gai) need to be steamed for at least 30 minutes. The only items the chefs prepare the night before are the baked goods, like the sweet and savory buns, and that's only because the dough needs time to rise. They keep the buns refrigerated at a specific temperature until they're ready for baking. 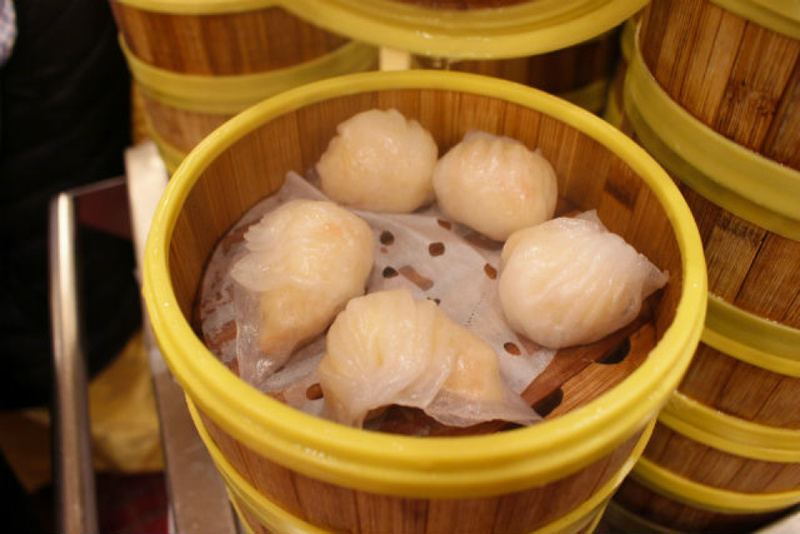 Among NBC Seafood's signature items, the steamed shrimp har gow and pork siu mai reign supreme. Chen is a purist about these dishes. When he lifts the lid off the individual bamboo baskets, he expects steam to billow out and the outer skin of the dumplings to glisten, an indication that they're juicy. The hallmark of good har gow is being able to see the pink shrimp through its delicate, translucent skin, which shouldn't break after steaming. 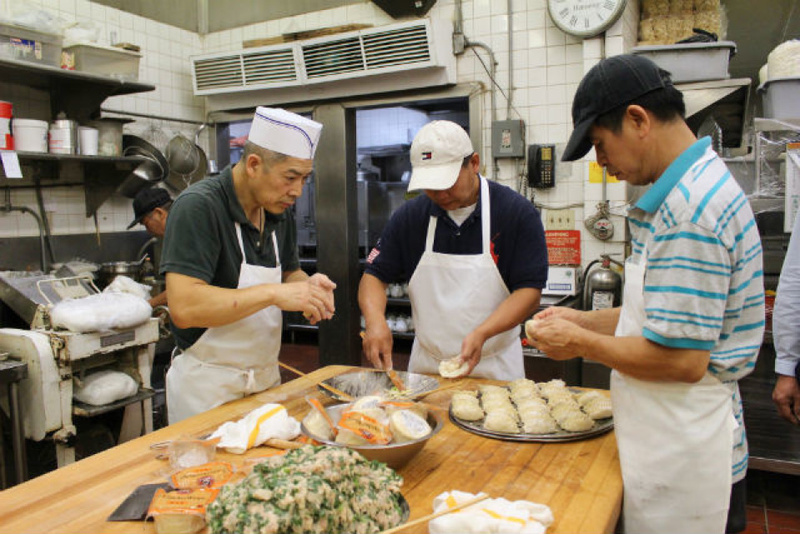 NBC Seafood has perfected the dough that creates this crystal outer layer and workers must follow the recipe to a T if they hope to achieve the right texture — and live up to Chen's exacting standards. The pork in the siu mai is marinated in a mixture of soy sauce, hoisin, salt and sesame oil but the real trick is encasing the filling in its thin, golden, wonton-like wrappers. "You have to wrap the skin and make sure it holds all the sauce and flavors inside, and even after it's steamed that it stays inside," Chen says. "If you don't wrap it well, that means all the juices [will leak out] and when you put it in your mouth, it's all dry." 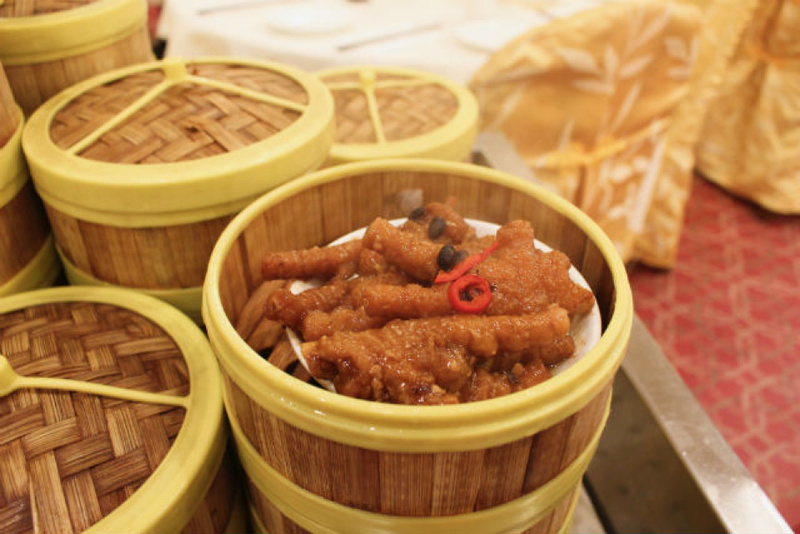 Dim sum restaurants like NBC Seafood live and die by these classic dishes. "This is the most important thing. Without your signature items, how do you run such a big restaurant?" Chen says. Customers learn to recognize these dishes, "and in their minds they think, 'When I want to eat a good siu mai, I have to go and visit [this particular restaurant]." Each dim sum maker specializes in a particular dish, so the items maintain a consistent look and taste. If Chen sees anything wrong with any item, he knows which employee to address. Out on the restaurant floor, the energy is frenetic as hungry families and groups of friends pack the tables, which are draped with white tablecloths and encircled by gold fabric-covered chairs. The room is surrounded by large stone pillars. The overall effect is grandness but it's tempered by how casually the staff pushes their dim sum carts around the dining room floor. On busy days, about 20 women in black vests wheel steaming metal carts between tables and pass around trays loaded with special items. 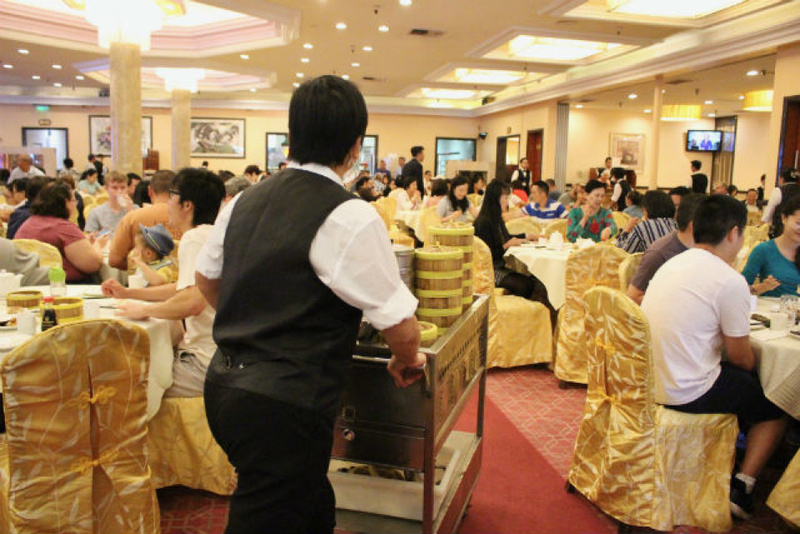 Waiters in red vests keep an eye on the tables, refilling teapots and bussing empty plates and bamboo baskets. By 11 a.m., the lines start forming at the hostess stand. By noon, they stretch out the door. About a year ago, Chen decided to replace all of their steel dim sum steamers with natural bamboo ones, an effort to be more hygienic and environmentally conscious, he says. Stacks of bamboo steamers fill the kitchen, towering so high they nearly touch the ceiling. Another new addition to NBC Seafood is the open-format mini-kitchen at the back of the restaurant, where customers can watch two chefs make new dishes. They can order these dishes at a nearby window or place an order with their waiter. Out on display are vegetarian dishes as well as new additions like a pot of chicken feet stewed in abalone sauce and dumplings fried on the spot. 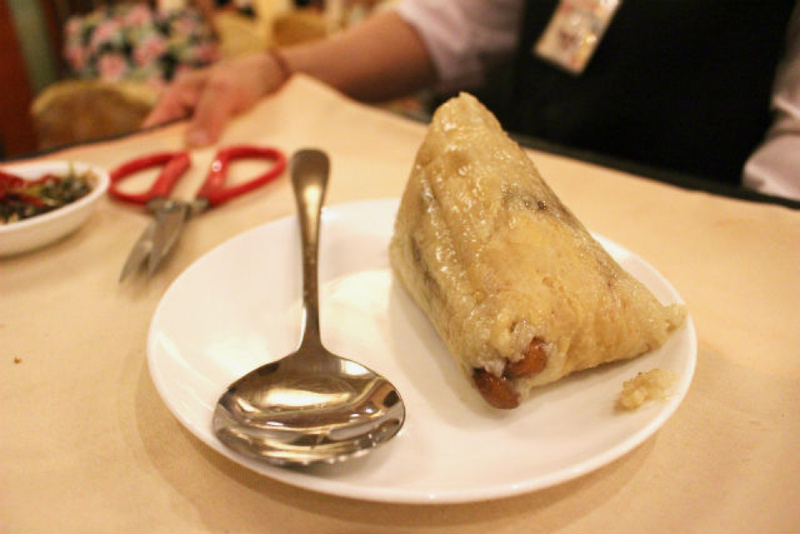 This month, the section features the seasonal zongzi, a sticky rice creation that Chen endearingly refers to as a Chinese "tamale." He says they borrowed the window idea from mainland China because they're looking for new concepts — and dishes — to bring back to the U.S. "That's how you can [make sure your] business is always booming," Chen says. 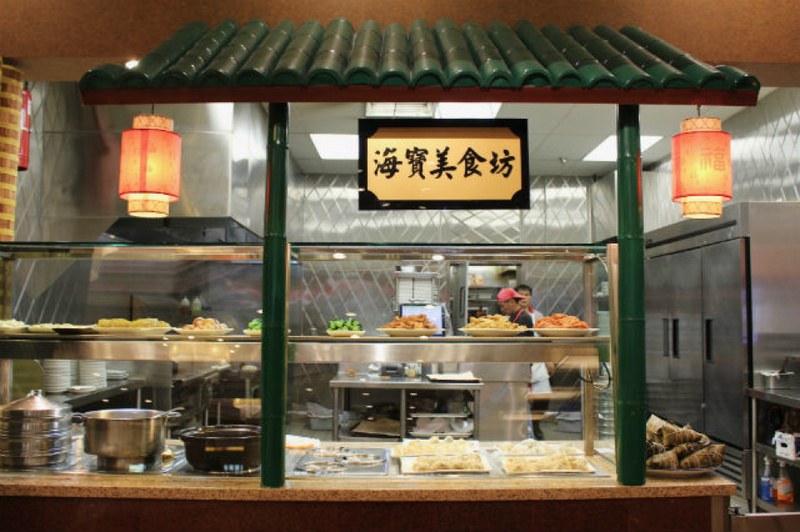 How much food does NBC Seafood prepare to satisfy their hungry customers? The restaurant has a controller who serves as a liaison between the workers on the floor and the back of the house. He checks to see how many customers are sitting at the tables and what food they've been able to order, then he reports back to the kitchen staff. He also watches the computer system for any orders placed through the back window. As the crowd dies down, so does the production line in the kitchen. The dim sum makers finish their shifts and leave to make way for the afternoon crew, which will prepare dinner service. When I ask Chen if his dim sum makers celebrate after they've finished their work, he laughs. "No," he says. "We're already used to this [kind of hustle]. The same [things happen every day]. After lunch, they go home and sleep. And the next morning at 6 a.m. they come [and do it all over] again." NBC Seafood Restaurant is located at 404 S. Atlantic Blvd., Monterey Park. (626) 282-2323.